View of Ayvalik from the hilltop. Stunning! which is at the end of a very long peninsula across the water from Ayvalik. 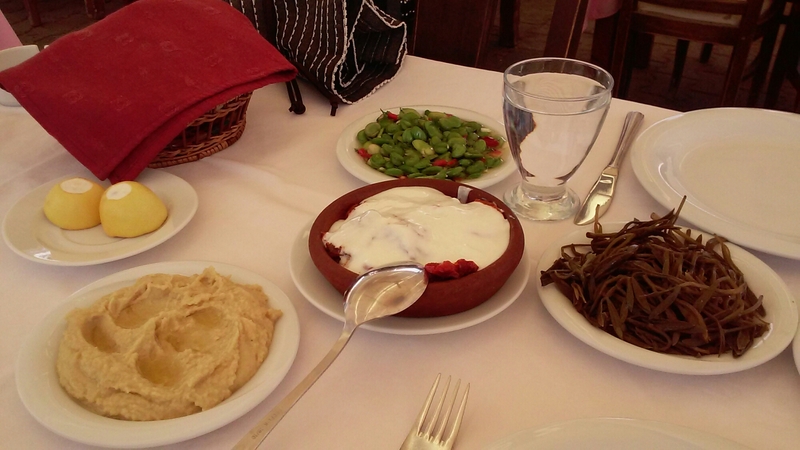 After getting rather lost in a residential area along the way we finally reached the shore of Alibey Adasi and were rewarded with a fantastic lunch of various meze along the waterfront. Then we hoped on a water taxi and crossed the bay back to Ayvalik and had a nice siesta at our hotel before going out in the evening. Our dinner experience yesterday was also quite charming. 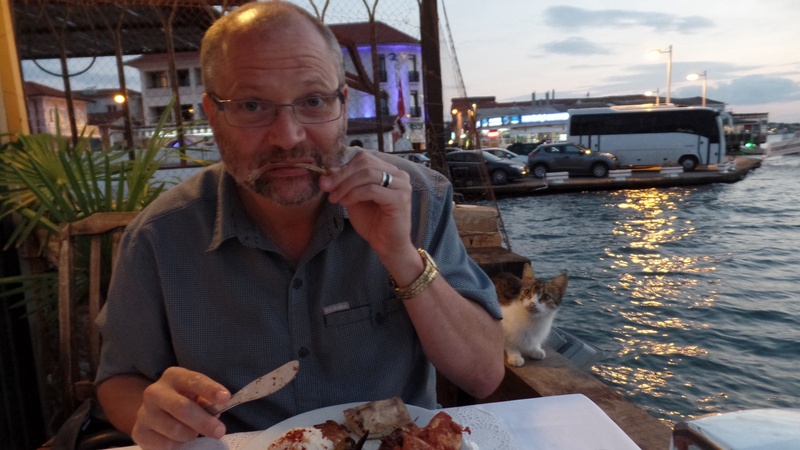 Tom rather reluctantly befriended a cat that showed up during our meal to stare at his plate of ‘mixed meat kabop’ until we gave her a bone. 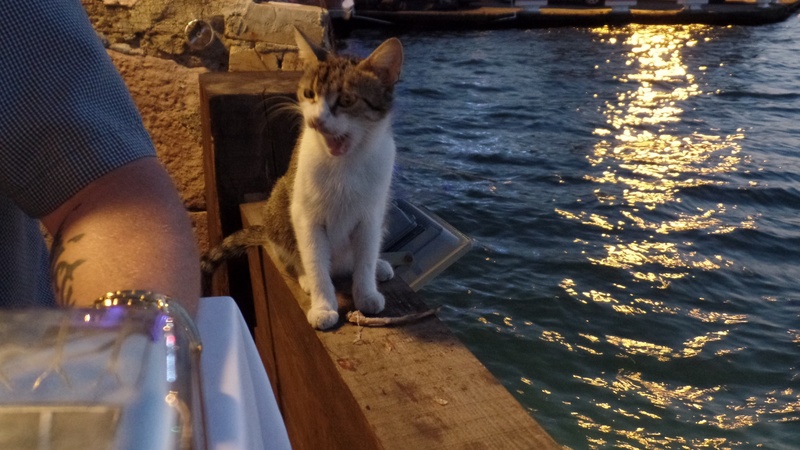 I can’t emphasize enough how much of a communal dogs and cats culture Turkey has. Dogs and cats co-habitat in all public areas and are given food and water by local merchants. 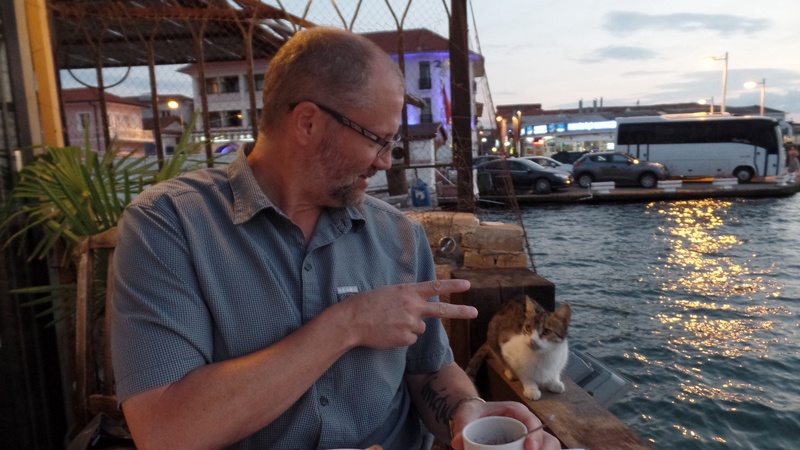 Befriending the cat at dinner. 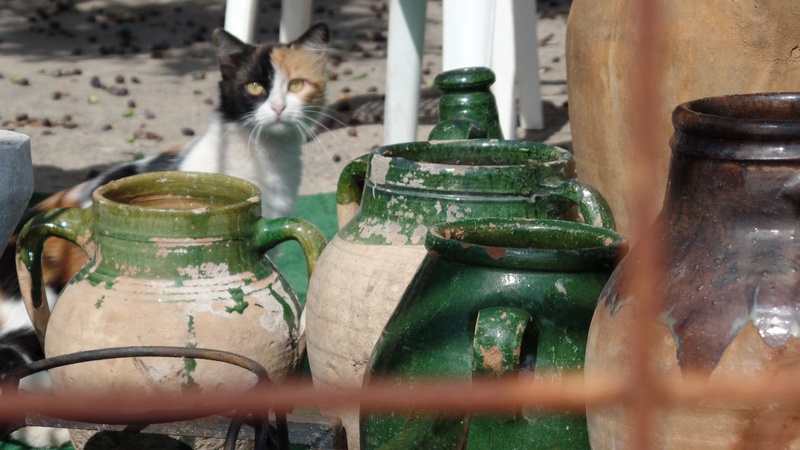 There are water dishes all over the place that are always full of fresh water, and we see small piles of cat food in corners of doorways and along the sidewalks. Come on, give the girl a taste, Thomas! What we have not seen any where is vermin–not one mouse or rat has shown itself in Turkey so far, which makes me think that allowing cats to roam freely keeps the rodent population in check. So, all in all, I have to count yesterday as my favorite day of the trip so far. The area we are in is both beautiful and much less busy than the previous cities we have visited. It is really nice to just walk and explore the area without concern of ‘missing’ some important historical or cultural site. This morning Thomas went and had a shave at a local barber shop, replete with ear hair removal, facial massage and cheek waxing. 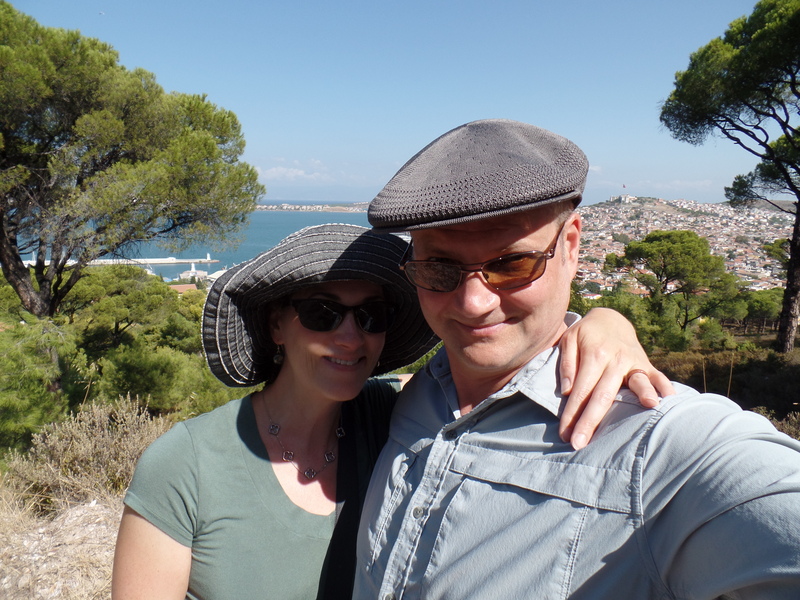 Then we went for a walk up into the hills that surround Ayvalik. The trails we found in the woods were not well-trodden, but seemed like marked pathways. There was a thick blanket of pine needles on the ground that made a lovely crunching sound as we wandered haphazardly up the hillside, and we seemed to be the only people walking in the area. Made it to the top of the hill, despite wearing sandals. And then I saw a snake cross the trail right in front of me and became suddenly anxious about wearing only sandals in the woods. Are there poisonous snakes in Turkey?? Needless to say we watched the ground carefully as we walked back down the hill, and I was grateful to be back on a paved road without encountering more woodland creatures. It is now 4:00PM here. We leave tomorrow morning for Selcuk, a town about four hours further south and the ‘gateway’ to Ephesus. We plan to have dinner later this evening at a restaurant that is run by the local fisherman’s association. 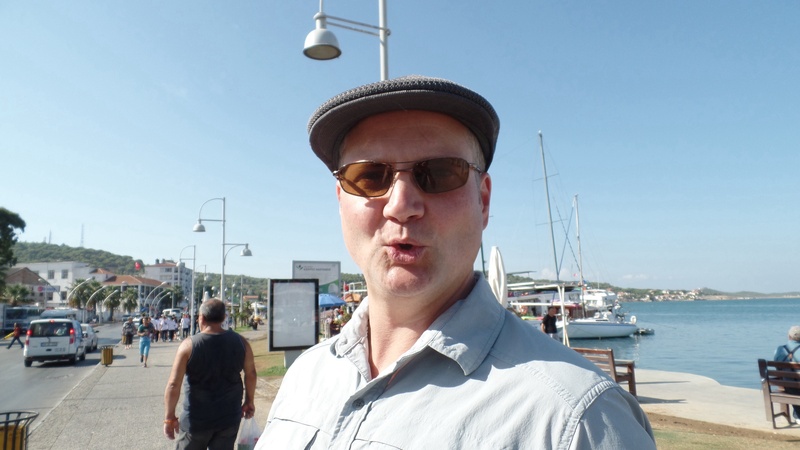 According to Lonely Planet there will be singing at this restaurant, so that should be a cool way to end our stay in the wonderful, charming, laid back town of Ayvalik. Can I admit that I miss it already?! I want to go to Ayvalik. Thanks so much for the wonderful description! Sounds heavenly and like you’ve found the right balance of relaxed and interesting. Keep enjoying. Tom looks quite jolly without his beard! Love to you both. Safe travels.